Accessories make the woman, so it is said. Therefore, a woman must pick carefully which pieces she chooses to “make” herself. An essential piece in every woman’s accessory wardrobe is a jewelry watch. The reason is you get two for the price of one: a bracelet and a timekeeper. Just Cavalli, the youthful and energetic extension line of Cavalli, offers just the answer with the Just Solo women’s watch collection. A lot of bracelet watches have trended upward and are rather big and chunky, which is definitely on point fashion-wise. However, there are times when a more subtle statement is called for and here’s where the Just Solo collection comes in. Hearkening back to a traditional style, Just Solo could actually be mistaken for a piece of jewelry. 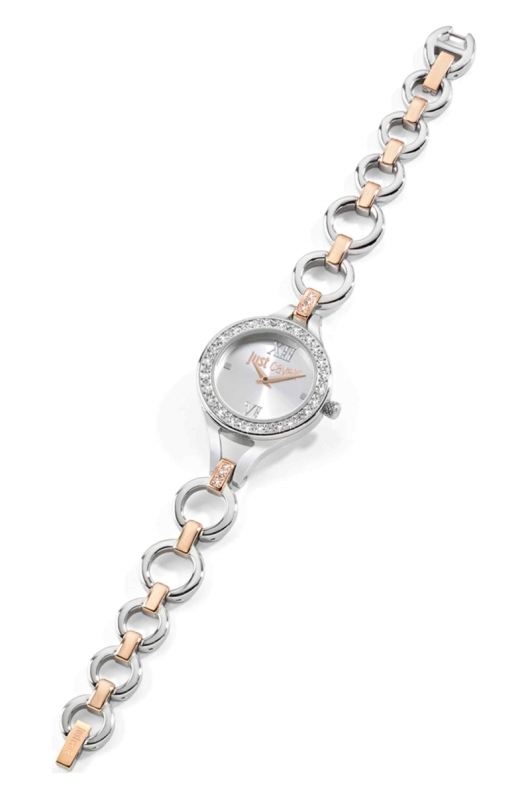 It comes in a delicately sized 30 mm case with a linked circle bracelet. The link between the lugs is embellished with diamonds giving it a chic extra detail. Although these watches are inspired by traditional pieces, they have been given a modern update seen in the style, design and materials. 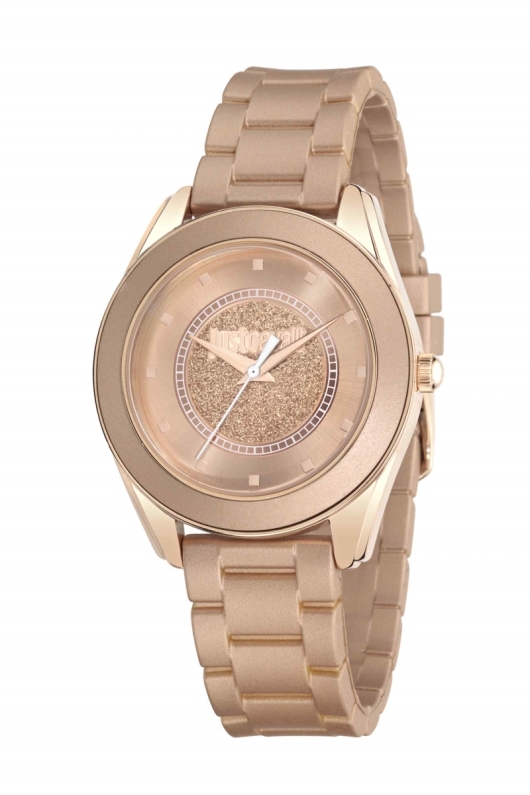 Cavalli is known for experimenting with textures and patterns and here we see it on the dial. There are two “wild” options of either zebra or snake scaled decorations. Maintaining the clean and sleek lines of the bracelet, the time only Just Solo dial keeps it simple with 4 diamond indexes at the quarter hours and the Just Cavalli logo centered underneath the 12 o’clock position. The diamond-enhanced bezel provides extra sparkle so the watch can be worn in formal or casual environments. The Just Solo comes in options of steel, yellow gold PVD and rose gold PVD. The watch is powered by a quartz movement and is water resistant to 99 feet. 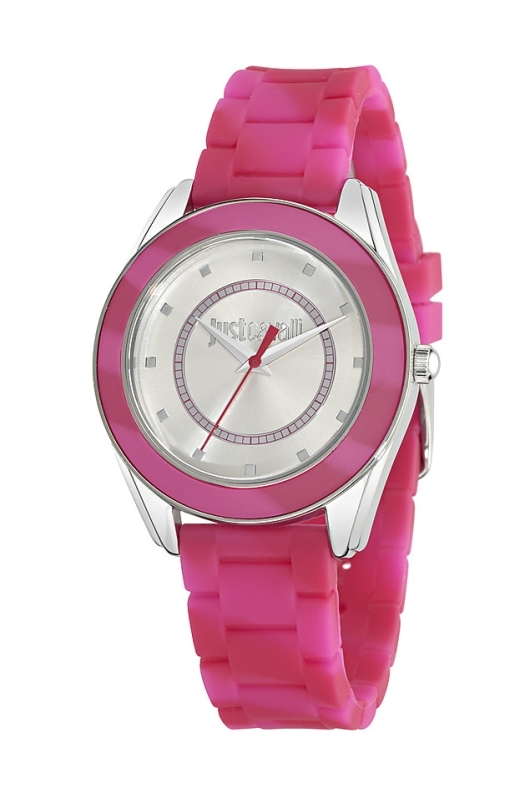 For a classic bracelet watch with a modern update, the Just Solo is one to have on hand in your jewelry box. 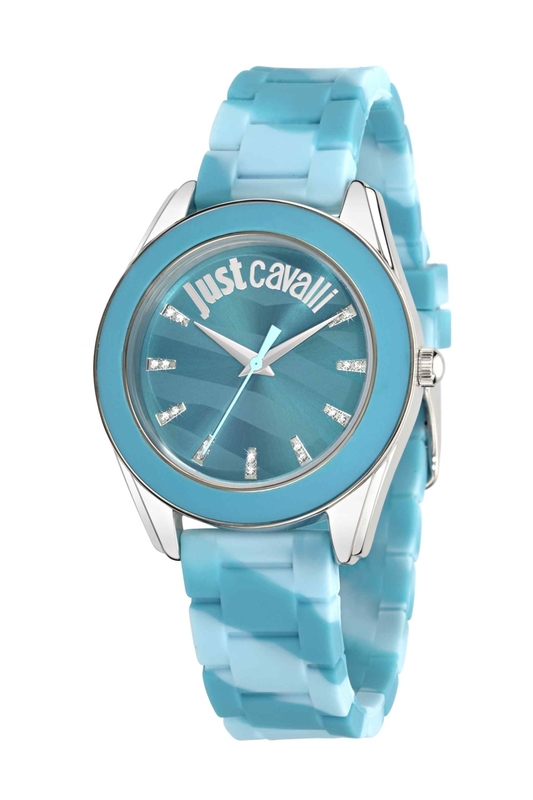 Purchase your Just Cavalli watch from an authorized Just Cavalli Dealer. Since appearing on the fashion scene, Italian designer Roberto Cavalli has consistently shown incredible imagination and creativity in his designs. Not only did he debut the sandblasted look for jeans and patchworks of different materials, he also invented and patented a way to print on leather. He brings that same original vision to his watches. Created in 2001, Just Cavalli is an extension line of the brand that caters to an international and younger, free-spirited generation. Just Cavalli watches followed in 2002. New to the line this year is the Spire collection. The name gives a hint as to the theme of the watches. Just as a spire can coil round, so too does a snake. One of the iconic symbols of the Cavalli brand, the snake appears on the Spire watch designed into the bezel with a crystal studded snake head overlooking the dial at 12 o’clock. The execution is so subtle and elegant that you wouldn’t necessarily recognize the hissing amphibian. The design works even better this way because it has the double effect of standing on its own as a lovely and fanciful case as well as incorporating the characteristic Cavalli snake. 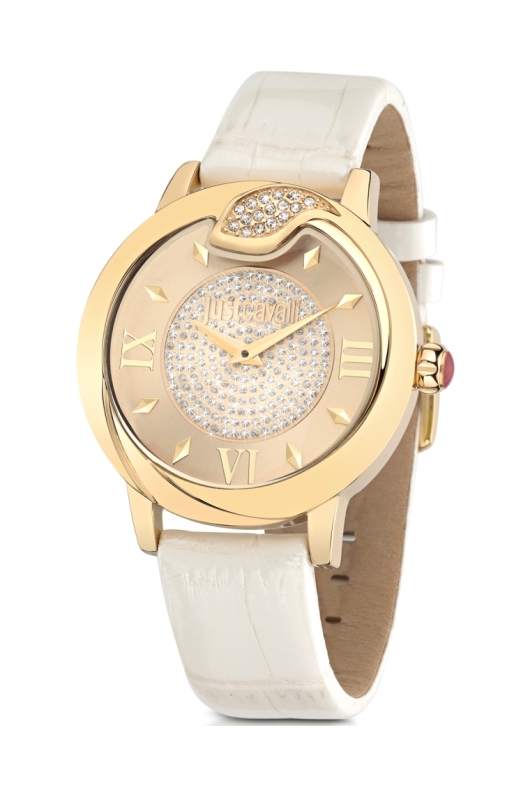 Since the case is so striking, Cavalli smartly kept the dial simple but luxurious. 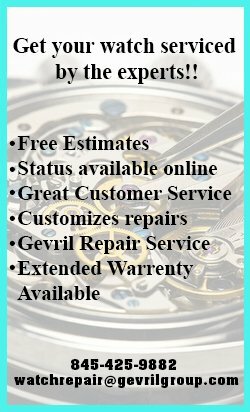 All of the iterations of the dial contain a mother-of-pearl element. It’s in the center of the dial and the numerals where there are differences that achieve alternate looks. 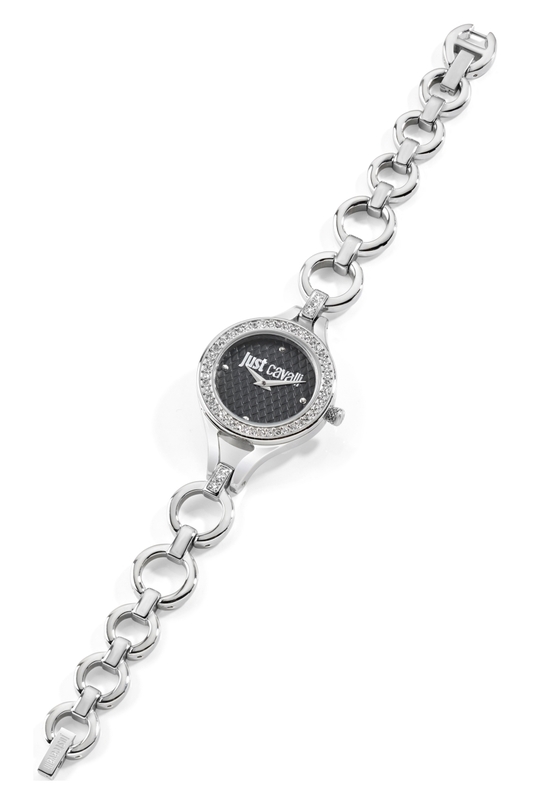 Some Just Cavalli Spires contain a circular center sprinkled with diamonds; hour indexes include baton and baton combined with either Roman or Arabic numerals. In a 40 mm stainless steel case, the Spire offers finishes in steel, yellow gold PVD and rose gold PVD. They come on either matching steel bracelets or on a crocodile leather printed strap. The Just Cavalli Spire collection captures high energy infused with sophistication. 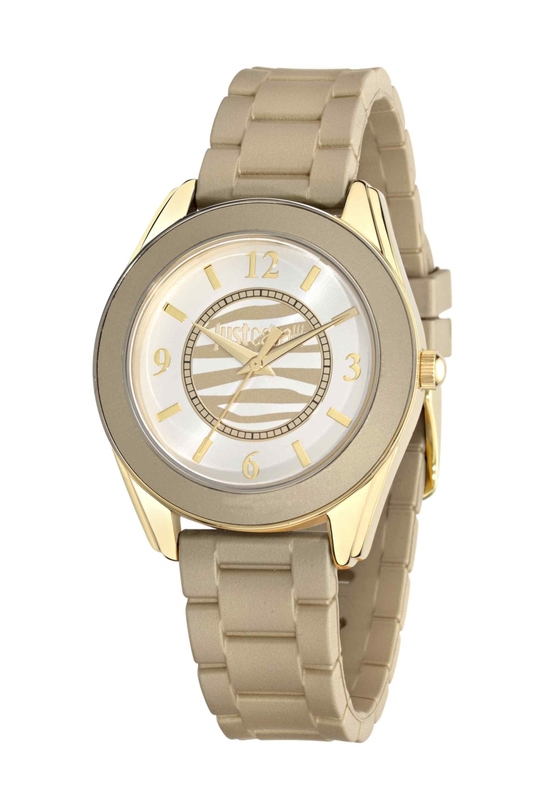 It exemplifies Cavalli’s spirit of experimentation and eclectic design and yet still maintains that timeless quality. 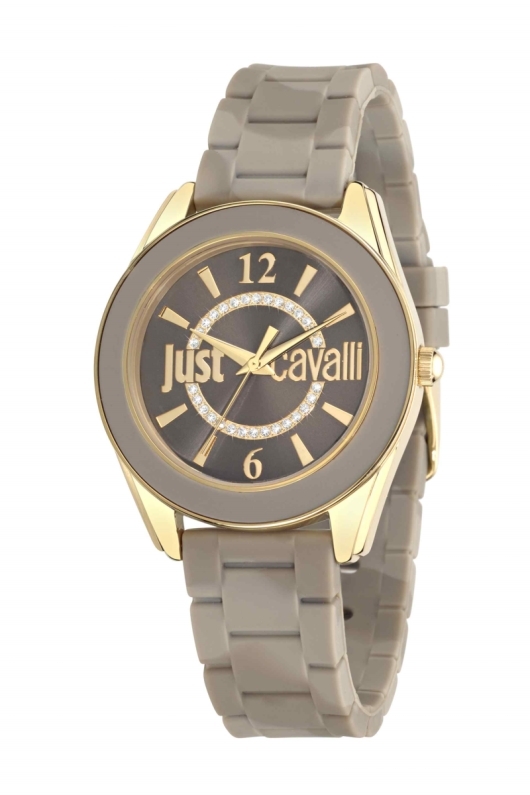 Purchase your Just Cavalli watch from an authorized Just Cavalli dealer. Italian designer Roberto Cavalli goes beyond just producing stylish products; he creates trends. Cavalli invented the sandblasted technique for jeans. It’s now a staple in the jeans category, because the process gives each pair a unique pattern that looks natural and lived in and also changes over time to express individuality. Cavalli applies original thought to all his diverse verticals including watches. The Just Cavalli Just Dream watch collection, part of the extension brand designed specifically for the contemporary, international and more youthful Cavalli customer, highlights Cavalli’s talent for anticipating their tastes and style. The Just Dream collection is a feminine tribute to the versatility of color and contains a playful energy. Fashion shows have lit up the runways with vivid color and the Just Dream collection taps into this trend. Purple, aqua, pink and lime hues are represented in the line, representing the sunny, recreational and carefree days of summer. Interestingly, in addition to the presence of color for the season, there is also a movement towards monochromatic compositions this season. The Just Dream collection also offers models for those who prefer this fashion forward look. There are choices of colors in white, silver, rose gold, cocoa, chocolate and white. The Just Dream collection comes in a modern sized 38 mm stainless steel case that’s fits right into the mode of larger watches, yet it’s not so large as to overwhelm a woman’s wrist. There are nine models in the collection to appeal to the various personalities. 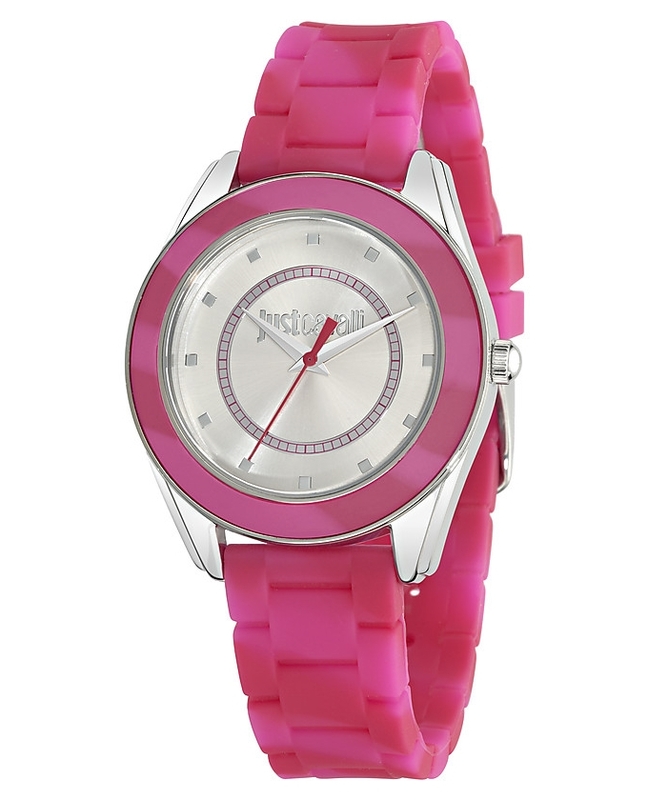 Choose from steel versions with glitter applications and a sunray dial to the colorful renditions, each of which conveys a different character. Finishes on the cases include steel, yellow gold PVD, rose gold PVD, zebra colored texture and come on a comfy silicone strap with buckle closure that keeps your wrist cool for the hot and sticky summer months. 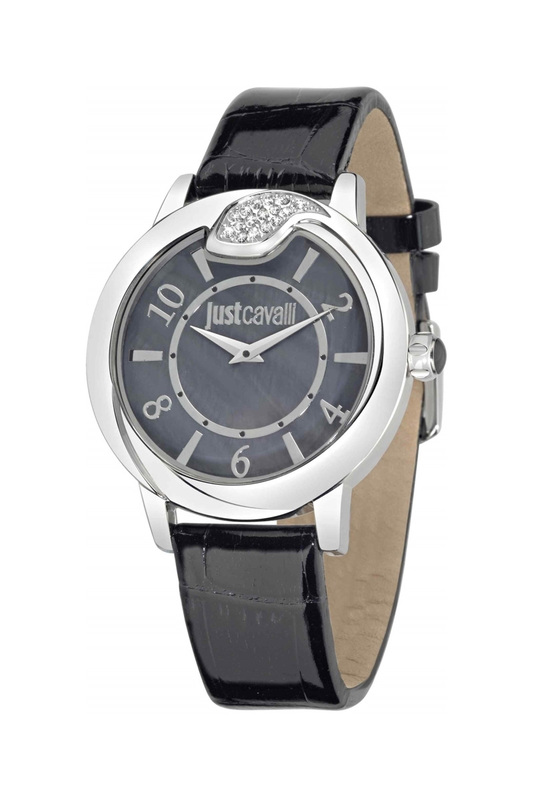 Powered by a quartz movement, the Just Cavalli Dream collection is water resistant to 99 feet. And, because they are all at a very reasonable price point, you can select more than one to express your different moods. Purchase your Just Cavalli watch from an authorized Just Cavalli Dealer. From the beginning of his career Roberto Cavalli strived to go against the grain to open up the fashion world to the road less travelled. He leads rather than follows. Since his signature collections skew toward a slightly older audience in style and price point, in 1998, he debuted another line in his oeuvre called Just Cavalli to appeal to a younger, hip crowd that wanted all the edge and vitality of the original designs. 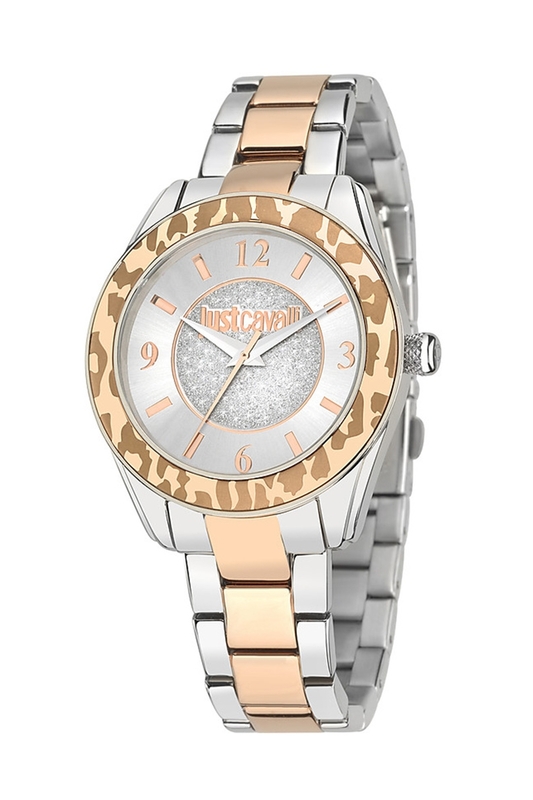 The Just Cavalli Style watch collection for women comes through on its promise of fashion forward looks that stand out in a crowd. As the name suggests, the Style collection exudes a vibe that fits the DNA of the brand but does so in a more subdued composition, as opposed to the more showy men’s Rude watch collection, demonstrating Cavalli’s range within the line. 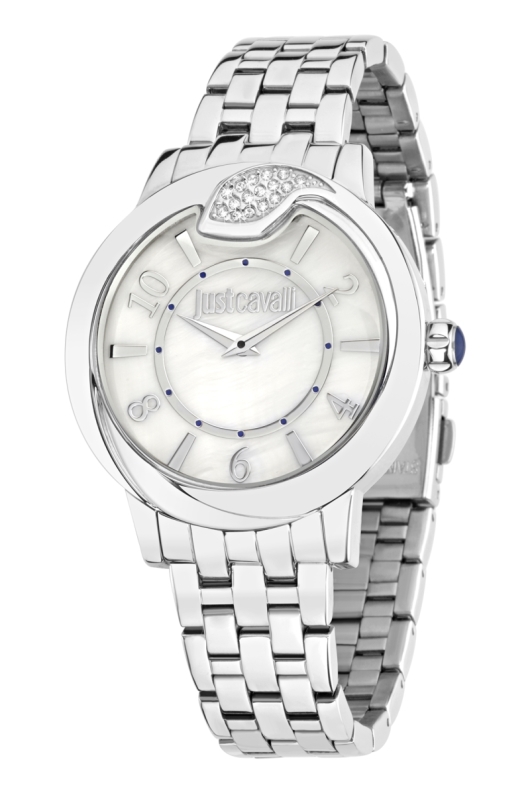 In a nicely proportioned 38 mm stainless steel case, the Just Cavalli Style women’s watch collection is a time only watch with a sweep seconds, dagger hands and grooved crown. But the similarities stop there. Each presents a different face to provide variety to meet a woman’s personality so she can make her own statement. 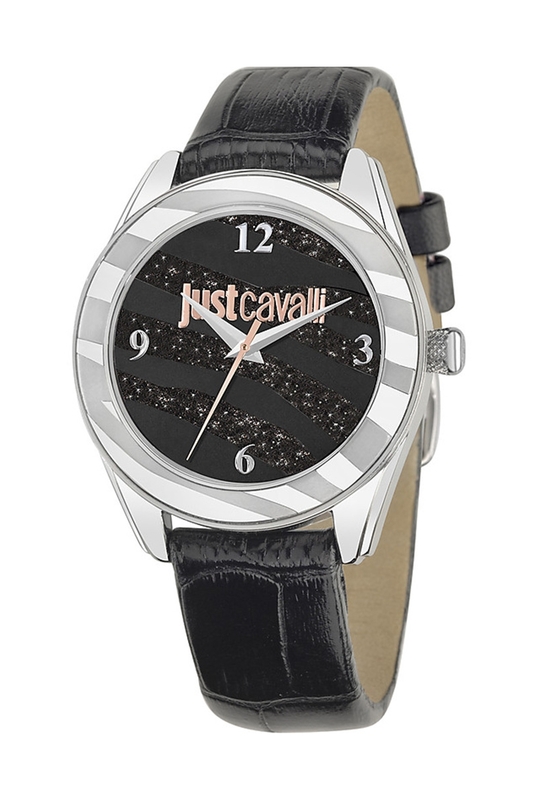 The dial of Just Cavalli Style R7251594502 resembles a meteorite with sparkly stripes against a black background and Arabic numerals at the quarter hours. 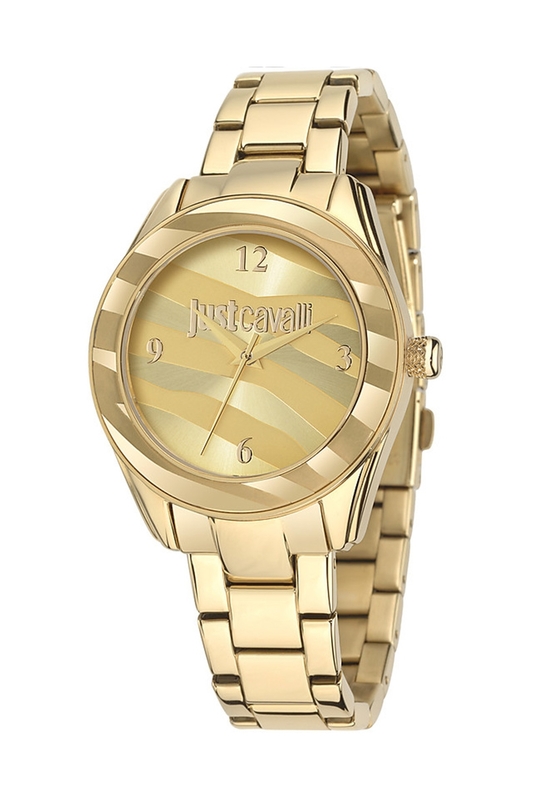 The Just Cavalli logo and seconds hand in gold give the dial nice contrast, while the tiger striped bezel adds just the right amount of the brand’s signature funky style. The watch, in a stainless steel case, secures to the wrist with a black leather strap. 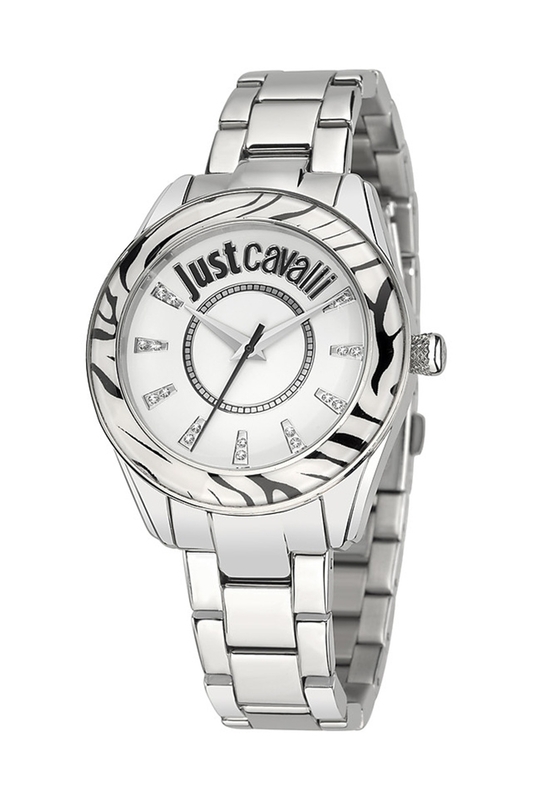 Another dial, that of Just Cavalli Style R7251594503, takes the tiger striped theme and places it in a grey and white pattern on the dial and bezel. The sparkly theme shows up again on the dial, but in a completely different composition. Crystals are embedded in the baton style hour indexes with the Just Cavalli logo at the top with a blue seconds hand ticking with accurate time. 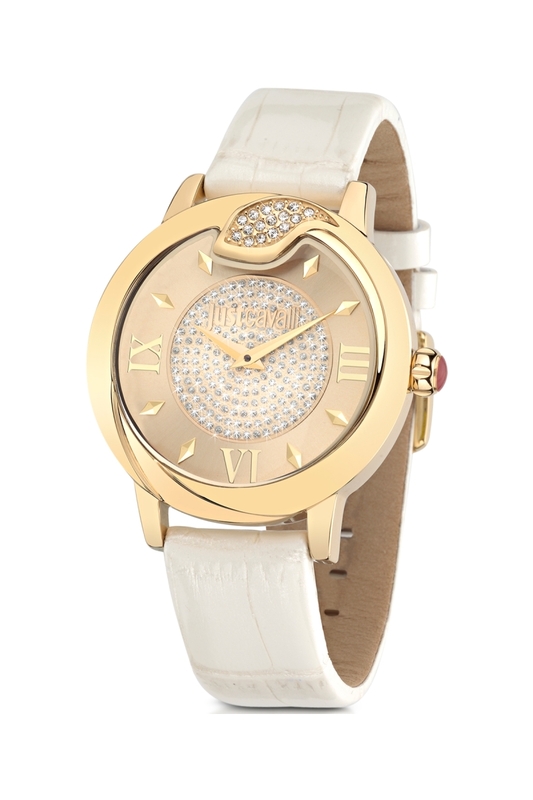 In a stainless steel case, this timepiece wraps around the wrist with a white leather strap. 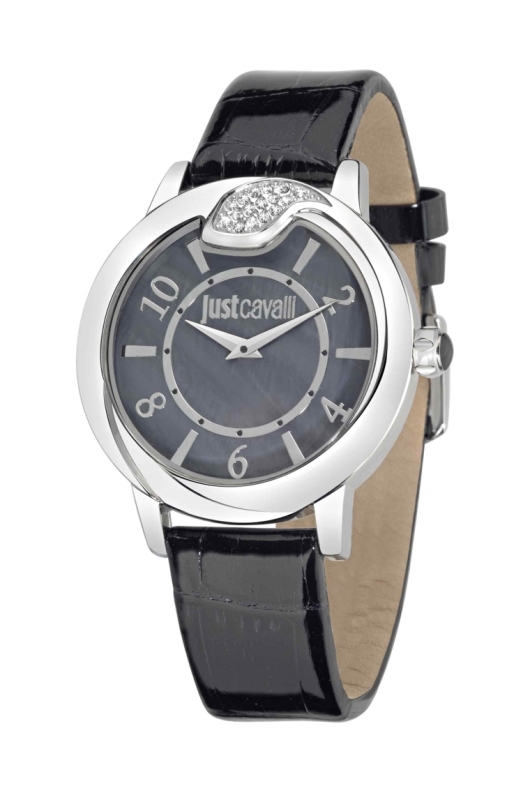 A similar watch (Just Cavalli Style R7253594502) uses all of these elements but changes the bezel to black and white and attaches it to a stainless steel bracelet. Continuing with the sparkling theme, the Just Cavalli Style R7253594503 features a silver dial with crystals in the center surrounded by Arabic and baton hour indexes in gold. The bezel this time looks more animalistic with its colors in brown and gold. A two-tone bracelet attaches to the two-tone styled watch, right on trend for the resurgence of the gold and silver combination. The Just Cavalli Style R7253594501 goes another route for those who like an all gold look, which, by the way, has made a comeback in accessories too. In all gold (stainless steel with IP gold coating), the watch has a monochrome look with its gold tiger striped dial, gold tiger stripe Arabic numerals and gold seconds hand, along with the gold tiger striped bezel. 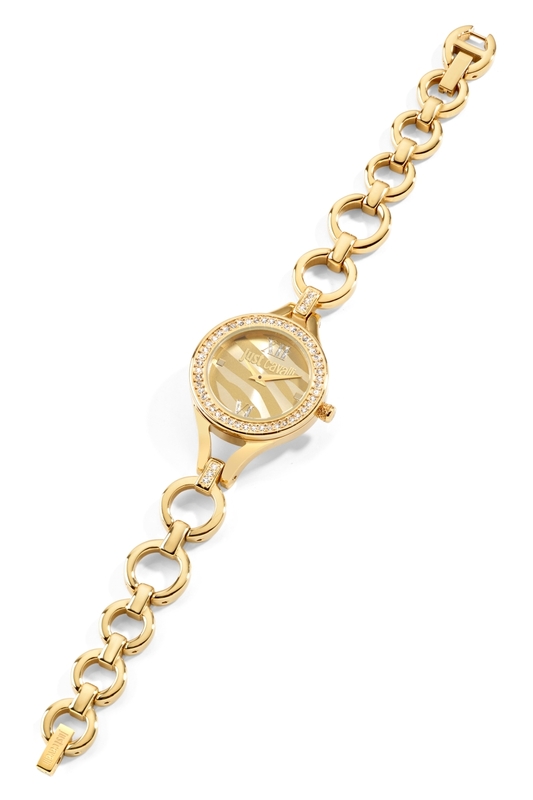 The watch comes on an IP gold stainless steel bracelet. For that Just Cavalli character to suit all tastes in a more dialed down presentation, the Style women’s collection is just the ticket. 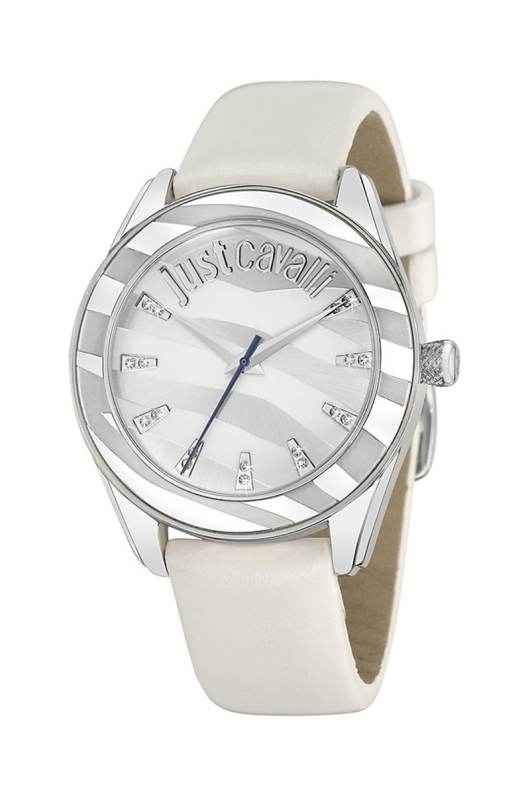 Purchase your Just Cavalli watch from an authorized Just Cavalli Dealer.